The AV4050 watch takes inspiration from the iconic Lancaster Bomber. From the marine grade stainless steel to the premium leather strap, the AV4050 is built with quality and endurance in mind. The dial displays day, date, seconds and 24 hour within individual gauges that mimic those on board the Lancaster. The dial has been manufactured with depth and detail to give the wearer a glimpse inside a wartime icon. It was common to decorate the front end of aircraft with pop culture references of the day. The “Sugars Blue” art on the AV4050 is based on a popular pin-up girl of the time. 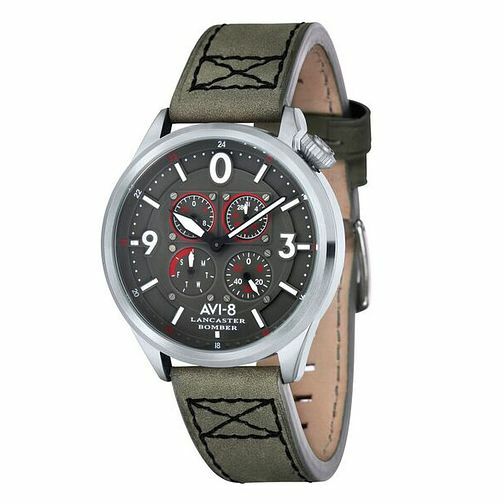 AVI-8 Men's Lancaster Bomber Grey Leather Strap Watch is rated 5.0 out of 5 by 1.